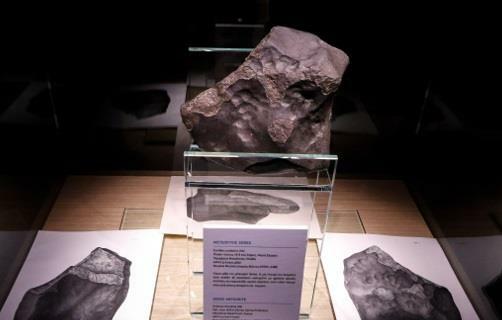 ATHENS, Nov. 7 (Xinhua) -- The only documented meteorite to have fallen in Greece went on display for the first time at Herakleidon museum here on Wednesday. The Seres meteorite, which is part of the largest meteorite collection at the Natural History Museum (NHM) in Vienna, traveled to Greece 200 years after its fall. "At the occasion of the 200th birthday, we decided to loan the meteorite to the museum here in Herakleidon, and we transferred it from the Natural History Museum Vienna for a few days," curator of the meteorite collection Ludovic Ferriere told Xinhua. "Seres is the only verified meteorite from Greece," Ioannis Baziotis, Assistant Professor of Mineralogy and Petrology at the Agricultural University of Athens stressed. Due to his persistent efforts and in collaboration with the museum, the meteorite, after its long journey returned to Greece to go on public display until Nov. 11. This asteroid piece, weighing 8.5 kilograms, completed its wandering in space in June 1818 when it was trapped in the Earth's gravitational field and fell in northern Greece, near the city of Serres. Exact data about the circumstances of the fall are not known. But, in 1844 the main mass of the meteorite landed in the Natural History Museum in Vienna. According to historical data, the stone was donated by the regional governor of Serres, the Ottoman Yusuf-Pasha to his physician. The physician brought the two fragments to Vienna and gave them to his former teacher, an Austrian chemist and botanist Johann Andreas Ritter von Scherer. On his part, Scherer donated the meteorite to the NHM in Vienna. Most of the samples of the Seres meteorite are in the NHM collection and other collections worldwide. According to Ferriere, Seres meteorite, which is currently under investigation in cooperation with Greek researchers, comes from the asteroid belt between Mars and Jupiter. "I like to call them extraordinary because they are like space gemstones. Everything from this meteorite tells us a different story, a different part of the history of the formation of the solar system," Ferriere said. By studying the meteorites, scientists learn details about how our solar system evolved into the Sun and planets of today, and how they could affect our future. So, the scientists opt to uncover more secrets from the existing meteorite collections by implementing new techniques available nowadays, said the curator.